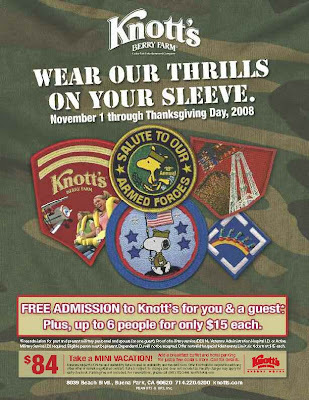 L.A., etc...: Veterans Free (11/1/8-11/27/8) @ Knotts Berry Farm! Veterans Free (11/1/8-11/27/8) @ Knotts Berry Farm! Knott's annual tribute to the U.S. Military, past and present. Veterans or current serving military personnel plus one guest get in FREE with proper ID presented at Knott's turnstile (DD214, Veterans Administration Hospital ID or Active Military Service ID). Purchase up to six additional tickets for just $15 each. This offer stands November 1st through Thanksgiving Day, 2008. Click here for more info. (Thanks for the heads up Gordon Gartrale garments, my pop is a Veteran).